Well, I’ve been meaning to make this post for quite some time – and now that I’ve actually got the time to do some photographs of the smaller details and put everything together, it’s time for me to actually put all this up! 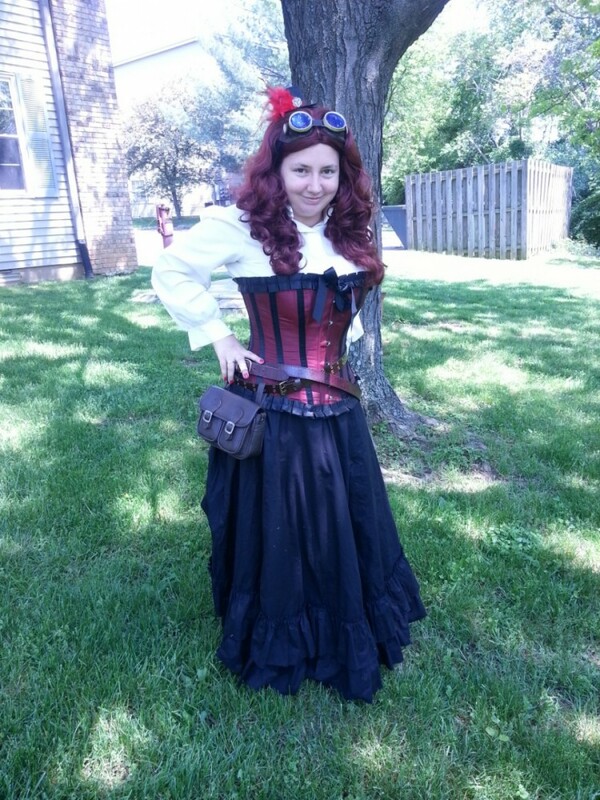 Have a look at what I’ve been calling the Amazing Steampunk Outfit! This costume has been about two months in the making – when I was in San Francisco back in March, you might remember that I found an amazing skirt and jacket combo, and snatched them up right away. 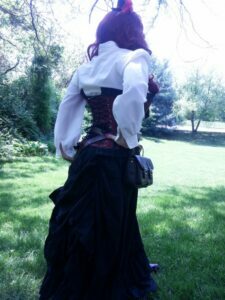 While I haven’t quite figured out how to work the jacket into anything yet, I knew the skirt just begged to be part of a steampunk outfit. You can’t see it terribly well in this shot, but the bustle is amazing and elegant – and I ended up building the ensemble around the skirt and the corset, which had been languishing in my closet for some time without a purpose. I ended up using a wig, too, as my hair’s currently way too short to do elegant things with. With those components, I aimed for a sort of elegant explorer theme with my costume. 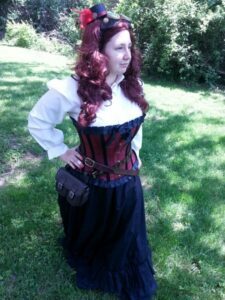 I was able to pick up many of the bits and pieces I needed from Goodwill, and made some other bits myself, like my tiny top hat. 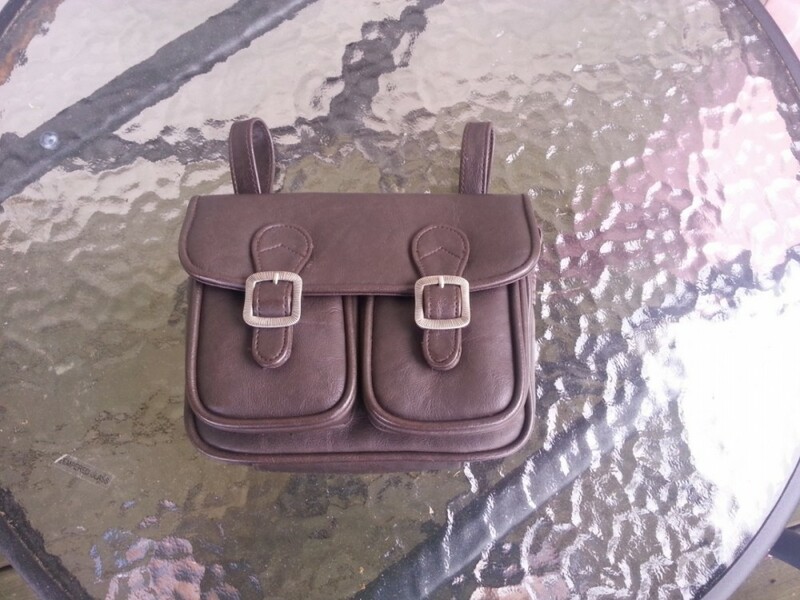 I’m actually rather proud of the hip bag – I saw a tutorial over on EPBOT late last year that stuck in my head and thought that’d be a perfect way to make a little belt bag for my costume. I snagged the bag for $2 at Goodwill, and turned it from a shoulder bag into a belt bag. 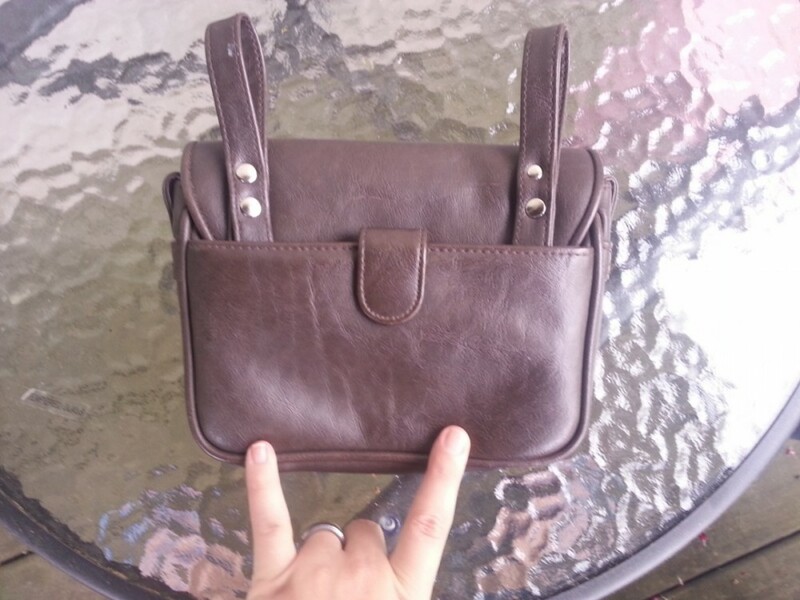 Here’s a front view of the bag – I ended up cutting off the shoulder strap, cutting that strap into two smaller straps, and attaching those straps to the back of the bag! It looks especially classy from the front, I think. And the back! You can’t quite see it on the sides, but I used a rivet to hold down the straps where I cut them – I just left them a little long, folded the sides over, and hammered a rivet in. Using a leather punch and hammering rivets into things is fun, and a good stress reliever, too, haha. 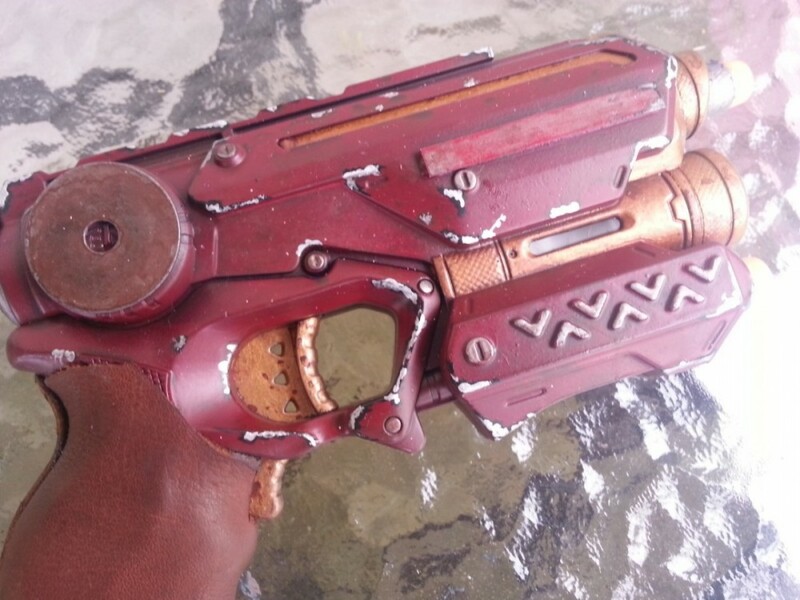 This last part is not my doing – this Nerf gun was painted by the talented Morgan! 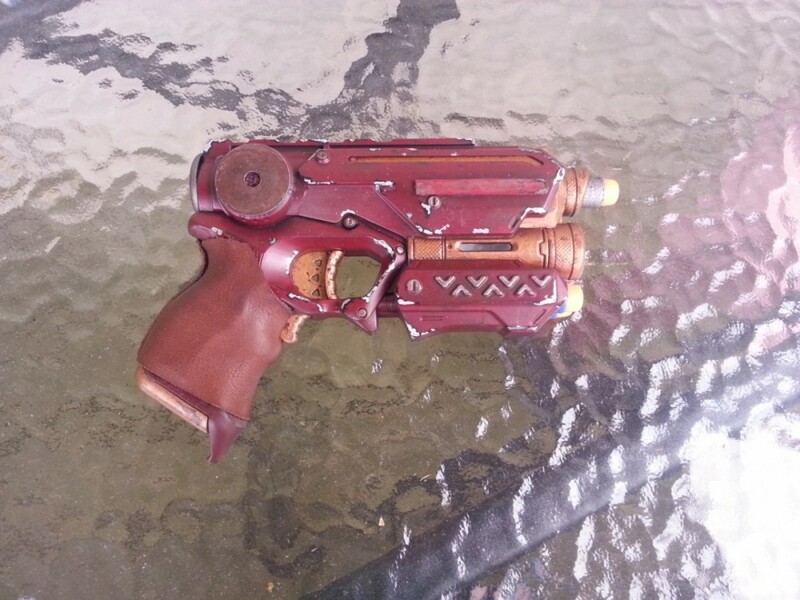 He paints minis, and I asked him if he’d be interested in painting a gun for me – and he did an amazing job! I’m especially proud of how well the “worn” spots turned out – it looks like it’s a well-loved metal gun, and not something made out of plastic! Here’s a close-up of some of the details – he did an amazing job. Too cute! Did you buy the corset or make it? Also, have you seen season 5 of The Guild? 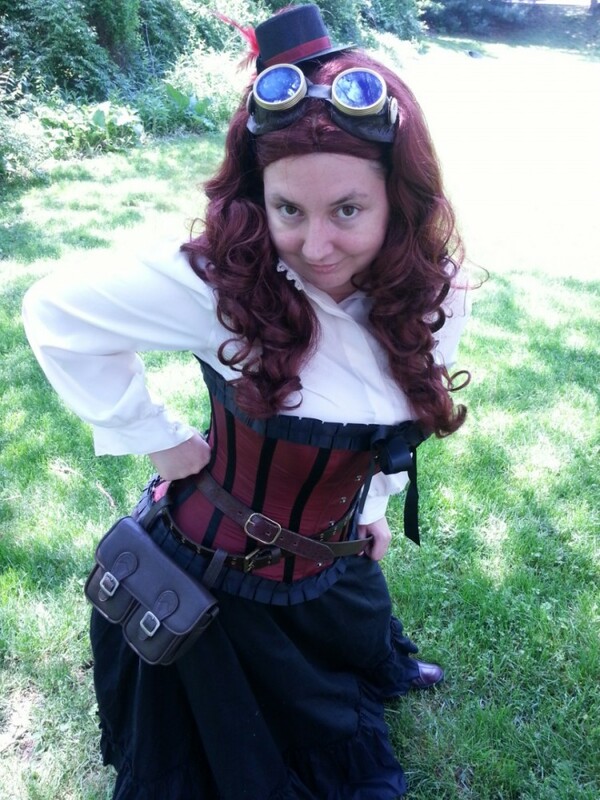 It (gently) makes fun of steampunk. This post made me think of it! I bought the corset – not QUITE sure enough in my sewing skills to make one yet, haha. And I really, really need to watch The Guild! I think I’ll do that this weekend, probably, while trying to finish up my Doctor Who scarf.